The Volkswagen Golf GTI TCR is a swansong for the German hot hatch’s seventh generation. The Volkswagen Golf GTI TCR is one last hurrah for the seventh-generation model, delivering 290hp in a front-wheel-drive package and some unique styling features. It draws from the mighty Clubsport S and almost matches the all-wheel-drive Golf R in the horsepower stakes. Don't let the images in our review put you off, as those honeycomb decals emblazoned along the taut flanks of the Golf GTI TCR aren't standard fit. In fact, they're a €750 option. But several other visual differences do make this last hurrah for the seventh-generation GTI stand out as something a bit special. The TCR is available in either three- or five-door configurations, sitting 5mm lower than the regular GTI, and some 20mm lower than the common-or-garden Golf. Behind the standard 18-inch alloy wheels lurk the same disc brake and pad setup from the Clubsport S, while larger 19-inch wheels are optionally available as part of an upgrade package that includes the upping of the top speed to 260km/h. Other visual elements on the GTI TCR include a bespoke front splitter and two additional water radiators like in the Golf R, to help cooling. Further back, there are sill extensions in a contrasting colour and a small TCR logo sits ahead of the rear wheel arch, while the rear spoiler gains a small lip on the end and a more purposeful rear diffuser rounds off the look. The traditional GTI tartan seat inserts make way for a bespoke TCR design and the sports seats hold their occupants in place. Volkswagen continues its motorsport theme with a leather steering wheel that has perforated leather on the sides and a red twelve o'clock marker at the top. Ahead of the driver is the digital Active Info Display that offers plenty of different views and data readouts, including a lap timing function. Few hot hatches can match the Golf GTI for its balance of accessibility of performance, ease of everyday use and driving pleasure. Now all those elements ratchet up a few notches with the Golf GTI TCR. Much of the chassis and suspension settings in the Golf GTI TCR are done with one eye on track work. The dampers have been subtly tweaked to suit the stiffer springs and lower ride height. None of these changes seem to detract from the comfort levels that the Golf provides on normal roads. Yes, there is a touch more road noise than we'd like at faster motorway speeds, but the whole package feels so solidly assembled that it's forgivable. It rarely feels unsettled either, and the steering calibration is near-perfect. Some may yearn for just a tiny bit more feel on initial turn-in, especially when you're attacking one of your favourite roads, but overall the steering weight and feedback and feel from what the front is doing is spot on. All that's missing is an Alcantara steering wheel. There is absolutely nothing wrong with the wheel in the TCR, but having had it in the Clubsport, and given the motorsport influence in this car, it would have been a great addition. The engine is the same EA888 unit that features in the other fast Golfs of the moment, but gets a specific tune for the TCR, which uses the overboost settings from the Clubsport as the baseline. That 290hp power output arrives at 5,400rpm and is constant as there's no overboost facility. Nonetheless, when you roll on the throttle, it feels effortless in getting up past 100km/h, thanks in part to the seven-speed DSG gearbox, but mostly from the swell of torque, 200Nm of which is on tap from 1,000rpm and the full 380Nm arriving just 950rpm later. Some with undoubtedly rue the fact that you can't have the TCR with a manual gearbox, and we can understand why. However, the DSG works so well that most drivers will be happy to let it do its thing. After all, most people who buy this car will use it day-in, day-out. Helping to transmit all that power into forward motion is the same VAQ electronically controlled differential that features in the GTI Performance, but with a specific mapping. When you get it on the track, this becomes even more evident, and you can feel it pulling the Golf around and out of slower corners when you're on the power. It works so well that you rarely sense any interruption in traction. In comparison to some of the faster all-wheel-drive hot hatches, the TCR feels more alive, more involving. Combining this with the beefier brakes and stiffer spring setup, the Golf TCR is even more rewarding to drive on track as well as on the road. You can push it harder, lean on it more in corners and brake that bit later. Other than perhaps adding some uprated pads, there isn't a great deal more to do to make this an ideal track day plaything. You pay the same €47,495 starting price for the Volkswagen Golf GTI TCR whether you choose the three- or five-door body, making it €2,325 more than the five-door Golf GTI with DSG. The standard wheels are the 18-inch 'Belvedere' rims, but 18-inch 'Milton Keynes' wheels are alternatively available. In all, there are five exterior colours available. Pure Grey, Pure White and Tornado White are no-cost options, while Deep Black adds €675 and Oryx White is €1,189. There is the option of having the roof painted in black, too, which costs a further €718, and if you want a panoramic sunroof, you'll need to stump up another €1,300. LED headlights and Front Assist come as standard. 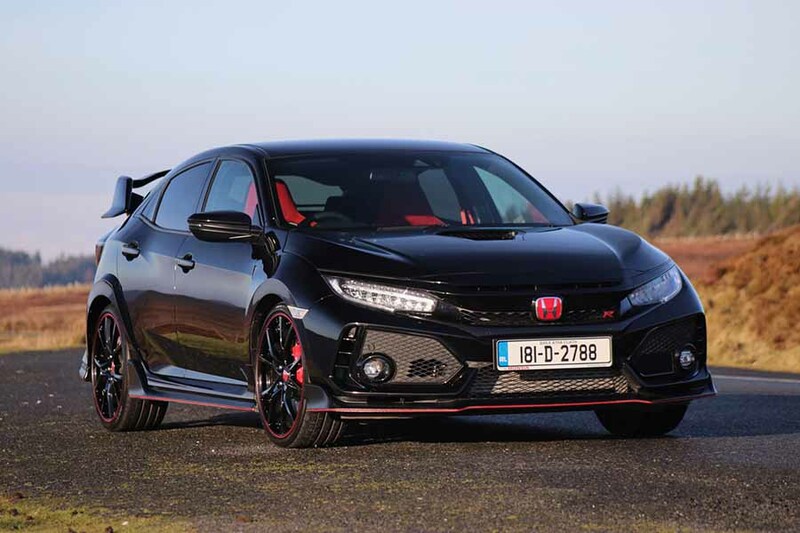 Other individual options include those honeycomb side decals at €750, carbon fibre look door mirror caps at €696 and Adaptive Chassis Control costs €1,077. If you fancy the Vienna leather upholstery for the sports seats it will set you back €2,033. There are two option packages available, both of which include the removal of the speed limiter, thus increasing the top speed from 250km/h to 260km/h. Of more interest is what else you get for your €2,895. The alloy wheels get an upgrade to 19-inch 'Reifnitz' items that have a matt black finish and are shod in 235/35 R19 tyres. Dynamic Chassis Control with adaptive dampers allows for more setup changes to be made, too. A second upgrade pack includes the same Dynamic Chassis Control system, but features 19-inch 'Pretoria' alloy wheels in a gloss black finish with anti-theft locking wheel nuts and sticky Michelin Cup 2 tyres. This package costs €3,895. Even with its wick turned up to 290hp, the Volkswagen Golf GTI TCR remains the consummate everyday performance car. Its ease of use in everyday scenarios and ability to now go even harder on track makes it feel that bit more special. In a straight point-to-point dash its all-wheel-drive sibling may have the edge, but for sheer driving pleasure, it's the GTI TCR that delivers. Honda Civic Type R vs. Volkswagen Golf GTI TCR (2019): also front-wheel drive and with more power; it's a superb chassis and more engaging, but it's less civilised on the road. 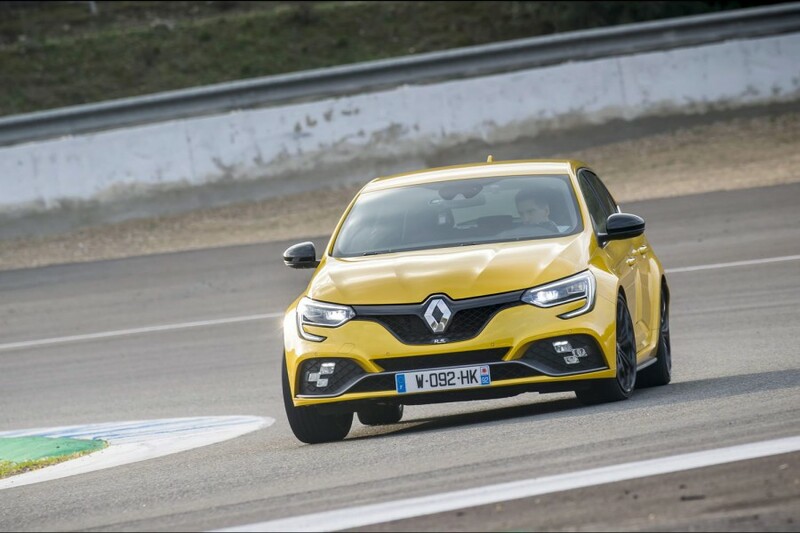 Renault Megane RS vs. Volkswagen Golf GTI TCR (2019): equally fast, but its automatic transmission isn't as sharp, nor is the design inside and out. 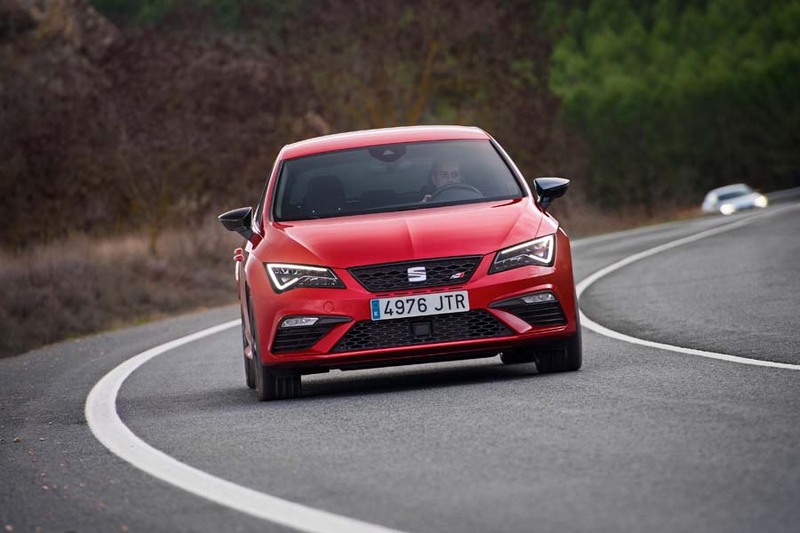 SEAT Leon Cupra vs. Volkswagen Golf GTI TCR (2019): the obvious comparison, with similar performance, but it's the SEAT's interior that lags the Volkswagen's.